The voting period ends at 8 p.m. Tuesday, Nov. 6. Western Washington County features a number of contests. 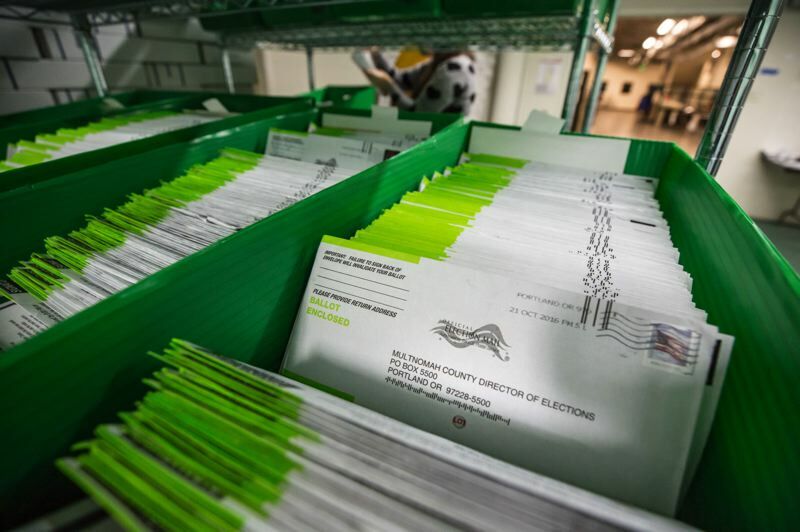 Today is the day — ballots are hitting the mail Wednesday, Oct. 17, according to the Oregon Elections Division. Election Day is Tuesday, Nov. 6. But since Oregon votes by mail, it's more apt to say that is when ballots are due, and when they will start to be tabulated. Ballots can be mailed back any time up to the weekend before Election Day, at which point elections officials recommend that voters use an official drop site to return their ballots in order to ensure they are received by 8 p.m. on Nov. 6. There are a plethora of races in western Washington County, including contests for city council positions, the chairmanship of the county commission, the governorship, the Oregon Legislature and the U.S. House of Representatives. Forest Grove, Cornelius and Banks are expected to re-elect their mayors, who are running unopposed. Gaston appears set to elect a new mayor, with incumbent Mayor Tony Hall not seeking re-election and City Council President Jerry Spaulding running unopposed for his seat. There are no mayoral races in Hillsboro and North Plains this year. Five candidates are running for three at-large seats on the Forest Grove City Council (a sixth, Karen Reynolds, has withdrawn but will still be listed on the ballot). Three candidates are running for two seats in Cornelius, and four are running for three in North Plains. In Hillsboro, two of three seats are contested, with Councilor Olivia Alcaire running unopposed. There are no contested council races in Banks and Gaston. At the county level, the retirement of Washington County Chairman Andy Duyck after 24 years on the county commission has set up a battle between Duyck-endorsed conservative County Commissioner Bob Terry and liberal Metro Councilor Kathryn Harrington. Although the position is officially nonpartisan, local officials and interest groups have more or less split along party lines, with Republicans generally backing Terry and Democrats largely supporting Harrington. The outcome of the chair race will determine the ideological balance of the Washington County Board of Commissioners, which is divided 2-2 between conservatives and liberals. Harrington was the top vote-getter in the May primary, but because she fell short of an outright majority, she was forced into a general election with the first runner-up, Terry. Turning to the state level, hot legislative races in western Washington County include Senate District 15, where now-Sen. Chuck Riley, D-Hillsboro, won by just 287 votes in 2014 and is now trying to fend off Republican challenger Alexander Flores of Hillsboro; House District 26, where freshman Rep. Rich Vial, R-Scholls, faces a spirited challenge from Wilsonville Democrat Courtney Neron in a district where registered Democrats outnumber Republicans; and House District 31, a rare Democratic district in Oregon that went for President Donald Trump in 2016, where state Rep. Brad Witt, D-Clatskanie, is running against Republican Brian G. Stout of Bethany. Several other local House and Senate districts are contested as well. The gubernatorial race is headlined by Democratic incumbent Gov. Kate Brown of Portland and Republican state Rep. Knute Buehler of Bend. Public opinion polls have shown a tight race, and both candidates have hit one another hard on the airwaves in the Portland-area television media market. Several measures are also set to be decided by voters this fall. Ballot Measure 102 would amend the Oregon Constitution to allow more public-private housing partnerships. It has no organized opposition and seems likely to pass. Measures 103 through 106 are much more controversial. Measure 103 would preemptively ban sales taxes on certain grocery items. Measure 104 would require a three-fifths majority of legislators in both chambers to approve any new fees or increases. Measure 105 would repeal a provision of the Oregon Constitution that prevents the use of state and local law enforcement resources to enforce federal immigration law. Measure 106 would prohibit abortion providers from receiving public funding in the state. The regional government Metro also has a bond measure on the ballot, Measure 26-199. The measure would authorize $652.8 million in bonds for the construction of low-income housing across the Metro area, which spans parts of Washington, Multnomah and Clackamas counties. • Banks Public Library, 42461 Market St.
• Cornelius City Hall, 1355 N. Barlow St.
• North Plains City Hall, 31360 N.W. 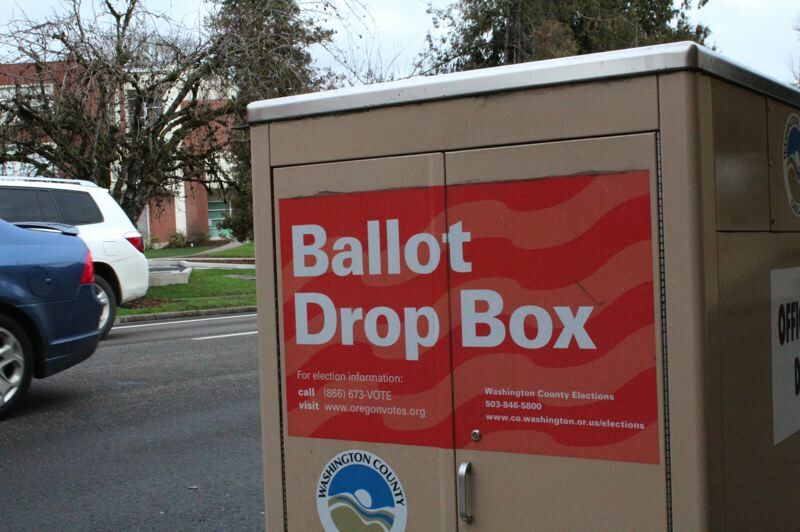 Commercial St.
• Yamhill City Hall, 205 S. Maple St.
Ballots can be dropped off at any of these sites up until 8 p.m. Nov. 6, which is the deadline for ballots to be received by the elections office. Ballots dropped off across the county line may be counted later than those in-county, but they will still be considered to have been turned in on time and counted under Oregon law if they are dropped off by 8 p.m. Election Day.